It’s always convenient to attend the Sheldon. Ample free parking is available on street and in two free municipal ramps within 1 block of the theatre. Designated handicapped parking is located on street directly in front of the building’s two entrances on 3rd St. and East Avenue. Minneapolis/St. Paul: Take I-94 or I-494 to the eastside and Highway 61. As you come into downtown Red Wing, Highway 61 becomes Main St. At the 5th stoplight on the corner of Main and Bush Streets (St. James hotel is on the left), Turn right. Go one block to 3rd St. and turn right. 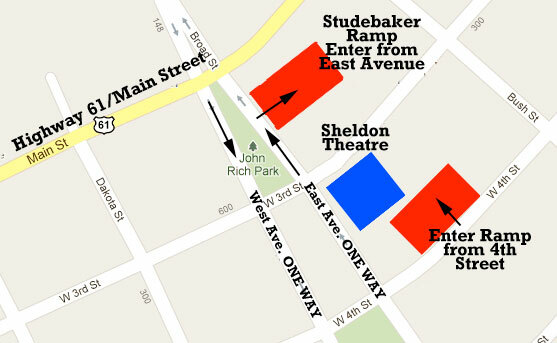 The Sheldon is located on the corner of 3rd and East Ave; across from the Red Wing Public Library. Rochester, MN: As you come into Red Wing, Highway 58 becomes Plum St. At the 2nd stoplight (across from Liberty’s Restaurant), turn left. You are now on 3rd St. Go 2 blocks straight ahead. The Sheldon is located on the corner of 3rd and East Ave across from the Red Wing Public Library. Wisconsin: As you come into Red Wing, Highway 63 becomes 3rd St. Go 3 blocks straight ahead.